IRVINE, Calif., June 21, 2018 /PRNewswire/ -- Taco Bell continues to innovate at the dollar price point and beyond, this time showing two is sometimes even better than one. The $2 Duo is the brand's new power couple and brings fans iconic items only Taco Bell could offer, including the Triple Melt Burrito and a Baja Blast, or any other beverage of choice, for just $2, and is available nationwide starting June 24. The $2 Duo is Taco Bell's new power couple and brings fans iconic items only Taco Bell could offer, including the Triple Melt Burrito and a Baja Blast, or any other beverage of choice, for just $2, and is available nationwide starting June 24. The $5 Steak Nachos Box takes classic nachos to the next level. With a double serving of flavorful, marinated steak and premium nacho toppings served over a bed of crispy tortilla chips, plus a drink, there's no better way to spend $5. "We have already passed the half-way mark in our commitment to introduce 20 new $1 items in 2018 with no intention of slowing down. It's part of our continued commitment to deliver unsurpassed craveability with unsurpassed affordability," said Chief Brand Officer Marisa Thalberg. "We know consumers are smart enough to discern the difference between 'cheap' vs. being offered something they really want, at an amazing price. That is the definition of true value, and that is where we will continue to land." Taco Bell is no stranger to unique menu item mashups, and the $2 Duo might just be its most perfect pairing yet. The $2 Duo includes the Triple Melt Burrito, which became an instant fan-favorite when it first appeared on menus nationwide in April. Fans will be excited to learn that all the seasoned beef, shredded three-cheese blend and warm nacho cheese sauce goodness is triple the flavor, but not triple the price. 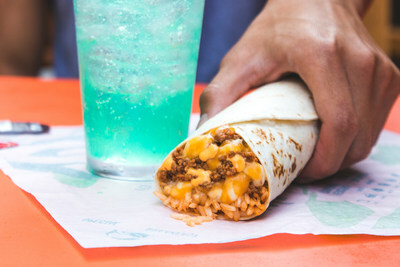 When paired with a Baja Blast, the deal demonstrates a unique value offering of iconic menu items that only Taco Bell can provide. Name a more iconic duo. We'll wait. 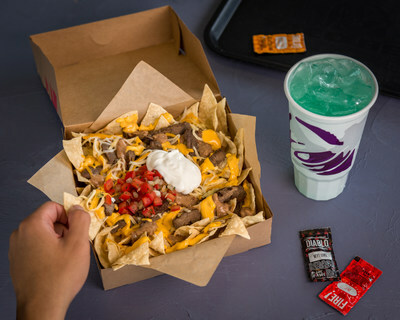 With deals spanning from $1 items to $5 combos, Taco Bell draws up yet another value play with the new $5 Steak Nachos Box. Available on June 14, this $5 Box takes classic nachos to the next level. With a double serving of flavorful, marinated steak and premium nacho toppings served over a bed of crispy tortilla chips, plus a drink, we can't imagine a better way to spend $5. Last but certainly not least, the Naked Chicken Chalupa is continuing its reign over menus nationwide in the form of a $5 Box available June 14. The Box features an original or Wild Naked Chicken Chalupa, a Doritos® Locos Taco, a Crunchy Taco and a Medium Drink, and for fans that just can't get enough of the Naked Chicken Chalupa, it can still be purchased a la carte for $2.99. We know that it's usually quality over quantity but why not have both at Taco Bell? Matt Prince – Taco Bell Corp.